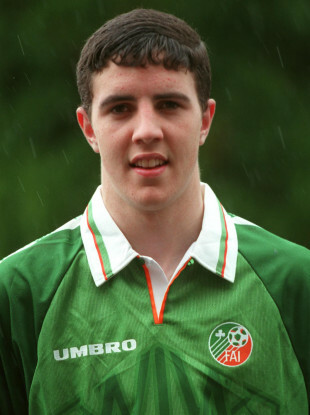 O'Shea as an U16 international back in 1998. WHAT AN INTERNATIONAL career it has been for John O’Shea. His days in a green shirt began with remarkable success as Ireland famously won the U16 European championships win in 1998. 20 years on, the ever-reliable defender will draw the curtain while earning his 118th senior cap in tomorrow’s friendly against the US at the Aviva Stadium. “A tall, lovely, smiley-headed gentleman,” Former underage and senior international manager Brian Kerr described O’Shea as on RTÉ’s Game On this week, while Roy Keane labelled him “a brilliant pro” and President Michael D Higgins praised “a tremendous representative for Ireland”. Speaking this afternoon ahead of his final appearance, the 37-year-old recalled having to initially deal with knock-back from Ireland as a teenager. “I remember the first time I was told I was going to be on the Irish panel after the Kennedy Cup squad,” O’Shea said. “You were told you were in the original squad and next thing the squad was announced and I wasn’t in it. I think my dad learned a lesson that day not to tell me anything until it was official. The following year, I was in the squad and that was the start of a great journey. To have success at the European championships that year was incredible. That got me onto the path of a professional career in Manchester. Originally due to sign for Celtic, O’Shea was persuaded to join Manchester United after being spotted by Red Devils boss Alex Ferguson, and he would go on to win every major honour during a 12-year spell at the club. He was handed his first senior cap for Ireland under Mick McCarthy in August 2001, during a friendly with Croatia at Lansdowne Road. “Immensely proud,” O’Shea replies, when asked about that day. “The area where I’m from down in Waterford, Ferrybank, [I remember] how proud they were after the work they put into me. “It was a culmination of all the coaches that you’ve worked with. Your family are extra proud too. Although he missed out on the 2002 World Cup, O’Shea enjoyed many unforgettable moments while on duty with the Boys in Green and appeared at major tournaments in 2012 and 2016. The one memory that probably stands out most, however, is his last-gasp goal to rescue a draw away to the world champions Germany in 2014 — fittingly on his 100th appearance. “Getting to represent your country at major tournaments has definitely been part of the highlights,” he says. “Then, on your 100th cap to score a goal against Germany, that’s particularly high on the list — especially for what it meant in the camp, to keep the campaign going and qualify for a major tournament. O’Shea will lead the team out one last time tomorrow night (8.08pm kick-off) and Martin O’Neill suggested he will be taken off at some stage to allow fans to give him a proper send-off. “I’m excited and looking forward to it now,” the veteran centre-half explains. “Looking forward to hopefully taking part in a good game and hoping to win the game, which is the most important thing, and enjoy it, as I’ve always done. O’Shea is out-of-contract at Sunderland this summer, and although he refused to be drawn on questions about his future, the defender is hoping to play one more season at club level. A model professional who has been described as a great man to have around the dressing room, his international manager O’Neill was also full of praise today. “He mentioned the goal he scored, it is 118 caps tomorrow?” the Ireland boss joked. “And he has that fantastic record of 3 goals! Considering the amount of times he went up for corner kicks. I used to tell him ‘Don’t go up, John. Don’t bother’. The goal against Germany, as he mentioned on his 100th cap, is a big, big highlight for me, obviously. Away from home, in Gelsenkirchen, the last minute of the game, against one of the best goalkeepers in the world. Really, really fantastic, and just to enjoy that there was worth it. “I had him at club level for a little while too and people shower praise on someone who’s just about about to leave, but he’s been a great influence. Even though, just in recent times, he’s had less chance of playing with other young players, to have him around and for him to not retire just after the Euros was particularly great for myself. That’s why I wanted him around for all to see. “You’d think the player who took over from him [as captain], Seamus Coleman, has learned a lot from John. He has a nice manner about him, he can be aggressive when he wants to be and when he’s arguing he can make a decent point too, which doesn’t help when you’re on either side of it. The last of a golden generation of Irish players, O’Neill went to to challenge the next crop to now step up and fill the void. Email “'The squad was announced... I think my dad learned a lesson that day not to tell me anything until it was official'”. Feedback on “'The squad was announced... I think my dad learned a lesson that day not to tell me anything until it was official'”.